Dog Aggression or Leash Reactivity? When dogs greet in a natural setting (not in today’s urban living) they greet in a “C” shape curve or side by side to smell each other’s rear ends. They don’t go up to each other face-to-face and stare. This is considered rude and offensive behavior. Now that dogs have to be on leashes in our communities, as it is the law (and safer for all concerned), dogs can’t just go up and perform their normal greeting behavior. When a dog does see another dog from a distance, across the street, usually on a walk, it is normal for him to look over and see who it is. He can’t interact with the dog normally (such as smelling to get to know him, etc.). He can only SEE the other dog. The other dog may look at him, too. This can potentially create a staring situation across the street. This may cause your dog to feel insecure about the other dog. When he sees the other dog “staring” at him, he may see it as the rude, offensive staring behavior mentioned above. He pulls forward and feels the pull of the leash. He feels restrained from being able to approach. Frustration ensues, and after a number of times he begins to feel frustrated seeing other dogs while on a leash at a distance. This is what is called conditioned frustration or leash reactivity. This can happen with any breed, and it is common in today’s style of living. This is not just an issue specific to the pit bull breed. Also, this does not mean that your dog is necessarily dog-aggressive or less tolerant of other dogs, especially if your dog is fine playing with his select, properly-introduced friends off-leash. The way to curb and/or prevent this behavior is to reinforce a different behavior. This means that you teach your dog to focus on something else instead of the dog over there. This can be a “sit” and “watch me” or you can also have your dog perform a down-stay and a look at you at the same time. Continuing to walk with your dog and having him look at you while passing the other dog is also very successful at keeping your dog from even locking into a stare-down with the other dog. Timing is key, don’t even let your dog stare at the other dog at all. This eliminates the frustration before it can even begin. If you wait until he’s already frustrated, lunging and pulling forward, he may not even hear you say, “look” or “watch me” at that point. These distraction techniques will prevent frustration from building up while on-leash around other dogs. A good leash manners class can help you learn these very simple techniques. Then you can take these techniques outside the class and use them in life in many different situations. Establishing good leadership with your pit bull is a very good way to start. This also helps your pit bull feel that someone is in charge and gives him a better sense of security around other dogs. The above is a very good way to set a good example in public with your pit bull showing good manners around other dogs. He can be taught to even be calm and focused on you even when other dogs are riled. This is very impressive in public and really shows off your pit bull as an ambassador. This article was originally posted on Our Pack, Inc.’s website, and is part of a series brought to StubbyDog from Our Pack, Inc. and Marthina McClay on Responsible Dog Ownership. Marthina McClay first learned to ride horses when she was 11 years old. At 14 she trained her two horses for Pole Bending and Barrel Racing. In the early 1970s she learned dog training the traditional way when her family owned Dobermans. She went on to pursue other careers but always lived with dogs and continued to train on the side. She became interested specifically in the pit bull breed in 2003. She had already begun training, studying and working with dog to dog aggression issues. Later she began rescuing/fostering pit bulls on her own in her home along with her resident pit bulls and thus Our Pack was born, a rescue, training and education organization. 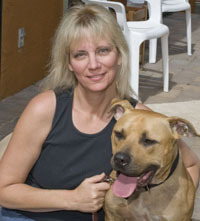 Her work has included large scale animal abuse cases that have occurred around the country, including the Michael Vick case. 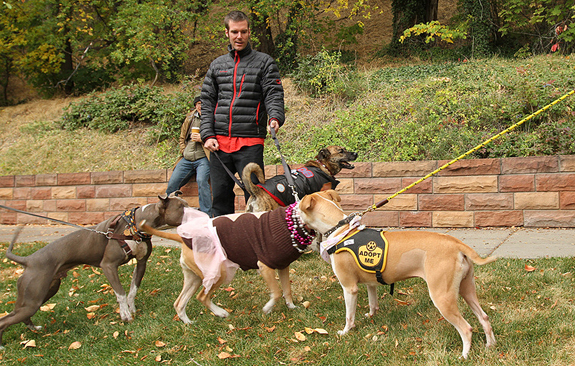 Many of these dogs are now certified therapy dogs. Her specialty is dogs that are reactive to other dogs or have leash reactivity.